You probably know that if you put a folder in the Dock, clicking that folder displays a hierarchical list of the folder’s contents. So it follows that if you fill a folder with aliases to your most-frequently used folders and files, and then stick that folder in the Dock, you’ll have easy access to those items and their contents, right? Sadly, no. 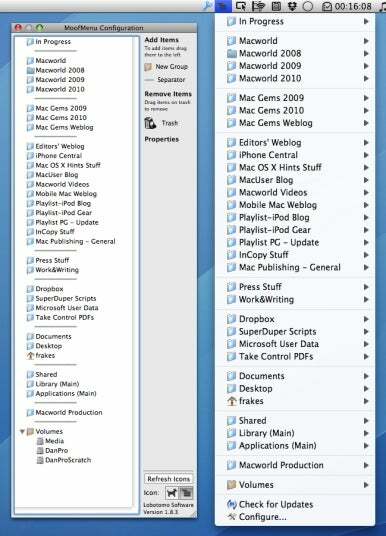 Since the release of Mac OS X 10.5 (Leopard), the Dock has been missing the ability to display the contents of aliased folders; you must turn to a third-party utility such as Quay to get it back. Unlike with some similar utilities I’ve seen, MoofMenu’s menus display quickly, and the program doesn’t patch other applications. A nice touch is that if you add a network volume or share to the menu, MoofMenu will automatically mount that remote directory on the fly to display the directory’s contents. Oddly enough, as with the Dock, if you place a folder alias in MoofMenu’s menu, that item won’t display a hierarchical list of its contents, nor will folders aliases inside folders you add to the menu. To be fair, there’s less reason to use folder aliases with MoofMenu, considering you can create your own custom groups, filled with the original items, within the menu. Similarly, invisible folders, such as /Volumes, can’t be added to MoofMenu’s menu, but, to use this example, you can easily create a group called Volumes and drag your mounted volumes into that group to get the desired effect. On the other hand, I do wish MoofMenu displayed custom folder icons, if present, and I wish you could drag URLs directly into the menu (in other words, without having to open the configuration window). There’s also no Quit option in MoofMenu’s menu or configuration window; to quit MoofMenu, you just press Command+Q when the configuration window is visible. This is a poor interface decision, because MoofMenu never has its own menu bar—the configuration window is a floating palette. This means that when the configuration window is open, you see the menu bar of the active application, which would lead you to believe that pressing Command+Q will quit that application, not MoofMenu. I hope that in a future update, the developer will remove this keyboard shortcut and simply place a Quit button in the MoofMenu configuration window.